The Sony PRS-T1 is an eBook reader with a 6 inch E Ink touchscreen display. It’s designed to run Sony’s Reader software for reading digital books — but the device’s firmware is based on Google Android and it turns out that the PRS-T1 can be hacked to run additional Android apps. One hacker has managed to add an app launcher, an Android terminal application, and a couple of alternate eReader apps including CoolReader and FBReader. Some apps, including Angry Birds, crash when you try to run them on theeReader. But let’s be honest — would you want to play Angry Birds on a tablet with an E Ink display and a slow refresh rate? Still, this could open up the Sony PRS-T1 for use with a wide variety of eBook apps, news apps, web browsers, or other applications. 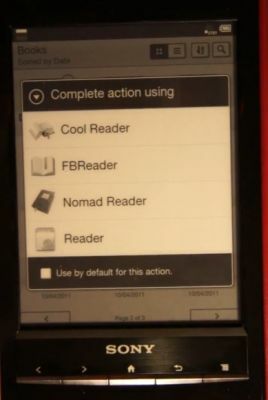 This isn’t the firs time we’ve seen an Android-powered eBook reader hacked to run apps that didn’t come with the device. The Barnes & Nobe NOOK Touch can also be hacked to run apps including the Amazon Kindle eBook app for Android. Sony’s latest eBook reader may be more versatile though, since it has a series of buttons below the screen as well as a touchscreen. The hacker responsible for the video says his project is still a work in progress and not ready for public release yet. Sony PRS-T1 is available from Amazon for $149 . I will look forward to buying another one of these eink devices that have Android and can be hacked, when there is one available in a 10 inch frame.